While the official announcement has not been released, on November 24th the Power BI feature to Download report became available. It is now possible to download Power BI Reports from the Power BI Service. To access the feature, click on the dropdown file menu of a report, and there you will see the option to download a report. If your report was not created recently, this feature may not be enabled. If the report was created November 24th or later, the download menu item should be enabled. After the download option is selected, a message pops up letting you know the report is being downloaded. The message is accurate as it took a good three plus minutes for the report to be downloaded. There are a couple of points worth mentioning regarding the downloading feature. Downloading is for reports, not dashboards or datasets. **UPDATE: on 11-29 Microsoft released the information about the download feature. It can be turned off if on the Admin Portal exporting data is turned off. Unfortunately there isn’t a way to just turn off downloading the reports, as that one option controls both downloading reports and data. Power BI’s report download feature has the ability to modify the development process in Power BI as it is now possible to use Power BI Desktop and provide the ability to create report versioning. Unfortunately, a report created on the service, cannot be downloaded as only reports which originated as desktop files can be downloaded. This is a problem as these files cannot be sent to SharePoint Online to provide versioning. One has to hope no one broke a report created on the service as there is no method to rollback changes to a previous because no file exists. This limits the use of Organizational Content Packs. A Content Pack is designed to be a starting point for report development as it contains everything needed to create a report, including a connection to a dataset, plus dashboards and perhaps a report or two to serve as a style guide. Content Packs are accessed by the arrow at the bottom of the Power BI Menu or by selecting Get Data, then selecting My organization to use content packs created for local data access. Now that anyone can use a report which has been uploaded to the service as a starting point for a new report, there may be a decreased use of the template feature. 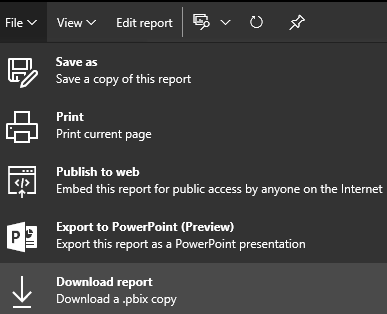 Any report created on the desktop can be saved as a template, by selecting save on a desktop report file and changing the file type to a template. Unfortunately, templates do not contain links to the datasource used. The person creating the report must determine what data to use and if there was a dataset presently used which is refreshing the data, or create a dataset and it’s respective refresh features as part of creating a report. Content packs provide the connections to datasets, but since the reports cannot be saved as a file for versioning, this feature is not often used instead of templates. Downloading the file and then modifying it is does resolve the issue as the starting point is then a working report with a connection to an existing dataset. Personally I have been waiting for Microsoft to release the download feature for a long time and am very happy to be able to use it. I hope that an some point the download feature will be expanded to reports created on the service as this feature will improve the report creation process. On October 24, 2016 Microsoft has created a new access right in Office 365, the Power BI Admin. This means that no longer does one have to be a Office 365 Administrator, a role with a ton of rights which have nothing to do with Power BI to be a Power BI Administrator. To be a Power BI Adminstrator, the Office 365 Adminstrator needs to run a PowerShell script to make a user a Power BI Administrator. Just change the email address and run this script. Add-MsolRoleMember -RoleMemberEmailAddress “user@useremailaddress.com" -RoleName "Power BI Service Administrator"
After running this script you will almost have everything you need to be a Power BI Administrator. The one thing that the newly minted Power BI Administrator cannot do is review the Audit Logs. The Audit Logs are the third menu item in the Power BI Admin Portal. As you can tell by looking at a copy of the screen below, Audit Logs are not really part of Power BI. Yes the ability to log all of the content in Power BI exists in the Audit Logs, but so does the ability to review the audit logs for things like Exchange Mailbox Activities and User Administration Activities. If the Office 365 Administrator has granted a user Power BI Administration rights, this is what the newly minted Power BI Administrator will see when trying to access any search activities. It appears that you the user has rights, until that user tries to do anything on the screen. At that point, this error window appears. To view audit logs, additional Office 365 access features are required. 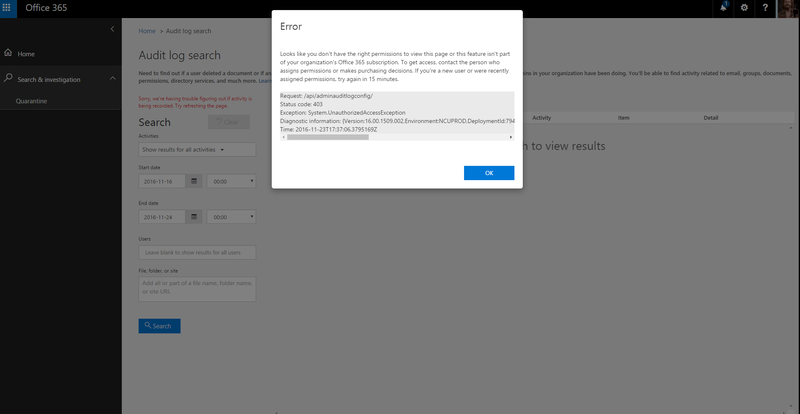 I did not figure out a way to turn on the audit feature unless one already was an Office 365 Administrator. If you want to view the audit logs, the first step should be to find out if they are turned on, because the steps I am going to show won’t do that. 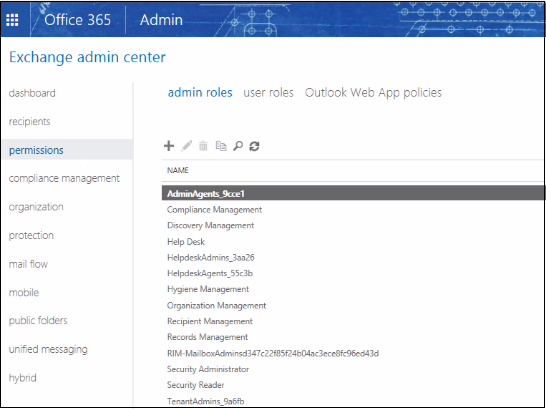 Within the Office 365 Admin center, go to the Exchange admin center and select permissions. Select the user and then add two roles Compliance Management and Organization Management. It is also possible to create a new role with Compliance Manager rights and add the Audit Logs and View Only Audit Log permissions, since those are the required permissions. None of this has anything to do with Power BI, which means when the permissions granted, users will have the ability to see all of the audit logs. After the new role permissions have been applied, the error message will go away and users will have the ability to see activity logged in Power BI as well as all of the Power BI Administration features. available in Power BI which do not require any knowledge of R. Six visuals is a far step away from the wide number of visuals available in R. According to the Comprehensive R [CRAN] as of today there are 9557 packages available for R, and that does not count all of the packages on GitHub. According to a September 8th post on the Power BI Blog, there are currently 352 R packages supported in the Power BI Service. For those of you wondering if your favorite R library is included (yes dplyr, ggplot2 and cluster are there) I have included the list of packages here. I hope that some day that this list becomes much longer, but it is a good start. If your company has lots R visuals and you wish to migrate them to Power BI, chances are some of the libraries you are using are not here. If you are interested in having your library added to the list of 352, go to the Ideas page of Power BI and request that your library be added, as Microsoft I know looks at this page to determine what to release in the future. Someone has requested that igraph be added, and since it hasn’t received a lot of votes yet (hint) it is probably low on the priority list. In reviewing the Power BI documentation online, it is not known what Microsoft’s plans are for future R packages. Does Microsoft plan on adding a lot more in the future? Will new libraries be added as part of upcoming releases? All questions where the web presently does not provide answers. The current package support in Power BI does provide the R developer with a method to more securely and widely distribute R visualizations. In my upcoming posts I will review how to use the six R visualizations which do not require R and also how to use R with Power BI.